It is based on Thomas Jefferson's own contest he had with his neighbors to see who could win a pea growing contest. Jefferson knew that healthy soil was key to healthy plants...especially his peas for the competition. He also worked with composting and finding ways for his plants to be resistant to insects. 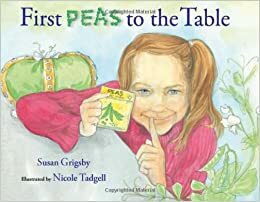 First Peas To the Table activity pack and some great illustrations I use for my kiddos to see the life cycle for my plant sheets in my plant packet. You can find them at: First Peas to the Table Coloring Sheets. You don't have to work at a school called Thomas Jefferson to inspire your students to this fun growing competition...just like one of our founding fathers. For more competition ideas, graphs, and certificates check out...first peas to the table graph and certificates and more. Family Garden Day...picking peas and more! Getting everyone involved...gardens do that! Can't wait to compete in our pea competition at Thomas Jefferson!